We're excited to have Monica Hesse join us to share more about her latest novel GIRL IN THE BLUE COAT. Monica, what scene was really hard for you to write and why, and is that the one of which you are most proud? Or is there another scene you particularly love? Journalists--I work for the Washington Post--want to get quotes right, so we're really attuned to listening to how people talk.They trail off, change subjects, and almost nobody is eloquent in real life, off the cuff. As a result, my favorite fiction scenes to write are always ones with lots of dialogue, where I can let characters' wonderful human imperfections come through. I loved writing scenes between Hanneke and Ollie, the brother of her late boyfriend. Action scenes are really hard for me, though, or anything with a love of movement and no talking. There's a chase scene in GIRL IN THE BLUE COAT that I put off writing again and again, until finally the rest of the book was done, and I had to go write those two pages or else there would be a gaping hole in the middle of the book. I'm both really rigid and totally disorganized when it comes to writing. I write a thousand words a day, rain or shine, cold or flu, usually late at night when I get home from my job. Writing every day is the only way I can make sure I keep up momentum with a project. If I haven't reached my thousand words, I feel as guilty as if I'd skipped brushing my teeth. But! When it comes to composing actual chapters, I'm all over the place. I almost never start from the beginning. I'll usually start somewhere in the middle and spiral out, and sometimes it's just a bunch of random sentences that I know will appear somewhere, eventually, hopefully. And all of this usually happens in my pajamas. Write! WRIIIIIITE. It sounds so basic, but I'm always amazed at how many people I meet who say they want to be writers but whose stories exist only in their heads and not on the page. The physical act of writing is always going to be the easiest thing to put off. There will always be something more interesting or more pressing to do. But you have to set yourself a schedule and make yourself stick to it, and you have to take your craft seriously so that others will learn to as well. Right now? A nonfiction book about a series of arsons in a rural county. It's totally fascinating. But as soon as I'm done with that, I'm back to World War II and a story set in an American internment camp, for which I'm now devouring gobs of research. 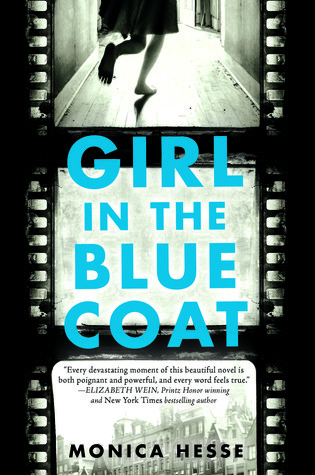 Have you had a chance to read GIRL IN THE BLUE COAT yet? Do you set a schedule and stick to it? Are you able to jump around while writing or do you write linearly? Share your thoughts about the interview in the comments!